Karen Stuke has always wanted to engage in the “other”, the “absolute” theater photograph. In other words, an image which unites everything, the entire scene, the entire act, the entire program. Thus she inevitably came to the camera obscura, an anachronistically slow instrument, which allows just such a view and with which she is meanwhile so intimate that she doesnʼt even consider it anything special – so masterly is her perfection of this tool. The images she records with it are “different” – this much is irrefutable. Whether they are proper and “correct” is unverifiable. They are the visible expression of a deep desire to respond to the extravagant world of the theatre with extravagant photographic images. Her production is doubled and even tripled. 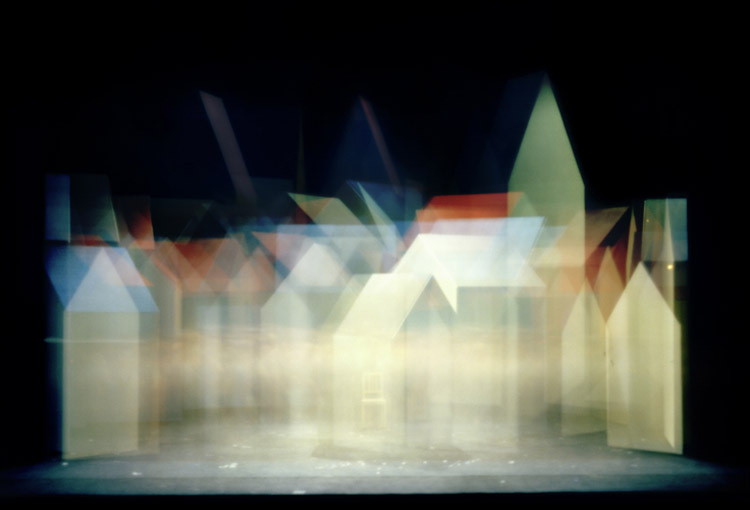 The artist responds to the production on stage with the production of the camera, which follows the production of the image in stagelike boxes. A new system of images is created.